Heat sauce over medium high heat. Slowly whisk in cornstarch mixture and simmer until thickened. Crumble ground turkey and garlic into the pan and cook until turkey is no longer pink. Add grated carrots and chopped broccoli about halfway through, when the turkey is still somewhat pink. Pour teriyaki sauce over cooked turkey and vegetable mixture. and stir. Simmer for about five minutes to combine the flavors. 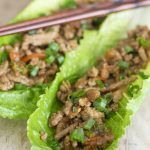 Spoon meat mixture into individual lettuce leaves. Serve immediately.